Acetylation is a highly conserved and reversible post-translational modification. It mainly takes part in regulating gene expression through modifying nuclear histones, but can also regulate several metabolic enzymes and metabolism pathways. There has been over thousands of acetylated proteins identified in proteomics studies. However, most acetylated proteins has very low abundance, hence, enrichment of acetyl-peptides can help to increase the sensitivity of mass spectrometry analysis. We use CST acetylation-specific antibodies for acetyl-peptide enrichment, and use 2-3 different enzymes for protein digestion to ensure full scan of acetyl-peptides. Moreover, the MS analysis can also be coupled with iTRAQ/TMT labeling or SILAC labeling to further increase the accuracy of relative quantitation between samples. 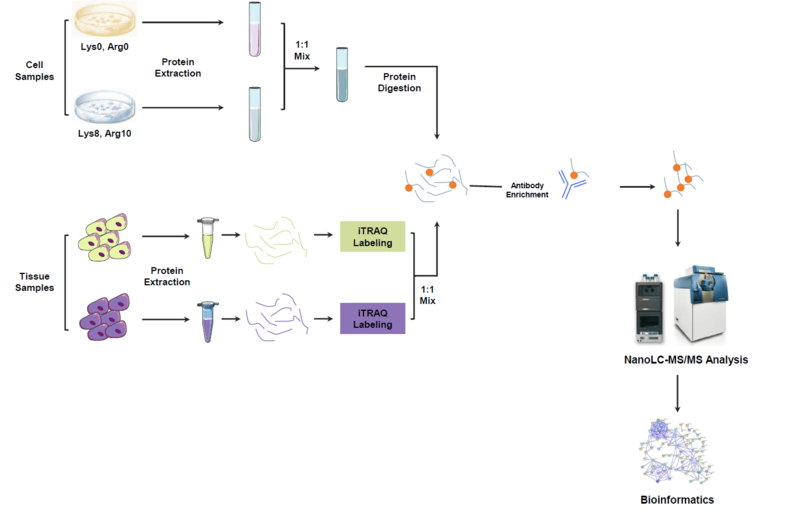 MtoZ Biolabs has developed a specialized platform equipped with Q Exactive HF (Thermo Fisher), Orbitrap Fusion, and Orbitrap Fusion Lumos mass spectrometers, equipped with Nano-LC for acetylproteomics quantitation service. To better solve your research problems, we offer an all-inclusive service, including protein purification, digestion, peptide labeling and enrichment, LC-MS/MS analysis, data analysis and bioinformatics analysis. All you need to do is to tell us your project objective, and send us your samples, and we will complete all the following experiments. Note: We will perform testing experiment before official experiments begin. To ensure the most cost-effective and accurate analysis is provided, only qualified samples will proceed to the official analysis.